-This is Sheen. He is the funniest character on Jimmy Neutron. He always does the dumbest things and mentions Ultra Lord. Reminds me of myself when I talk about Aqua Teen Hunger Force. This is pretty much the poem I live by. I saw this poem for the first time during an enlgish assignment. So umm take a look it's very good. -This is Towelie. He has made a couple of appearences on Sout Park. He is a towel made by an alien company that wants to take over the world. They made towelie to advertise towels but he got high one day and got lost. I highly recomend watching South Park on comedy central. My favorite show. -This is the show Aqua Teen Hunger Force. This show is very stupid/funny. It's on on Adult Swim (cartoon network) Sundays 12:00 AM and on Mondays though Thursdays 12:00AM and 12:15AM. My favorite character there is Master Shake. The fries is named Frylock. The meat thing is named Meatwad. It's my second favorite show behind South Park. -This is Sealab 2021. This show is a stupid/funny like Aqua Teen Hunger Force. Both shows are made by Williams Street. The funniest character is Captain Murphy cause he has absolutely no intligence but he is still captain. This is on right after Aqua Teen Hunger Force at 11:45AM Monday morning (Sunday night). This is my niece Jayden Elisabeth. 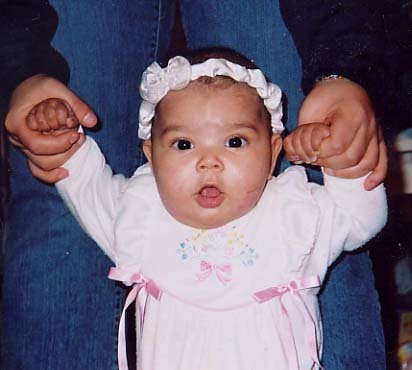 She was born 6-30-03, weighing in at 8 pounds 5 ounces and 21" long.